Last week Dominion CEO Tom Farrell, in collaboration with Kelly Chopus and Harold Fitrer, issued a plea to greater Richmond: Give our superintendent a chance. The op-ed attempts to position Jason Kamras’ hiring as a “community process,” downplaying Farrell’s own undemocratic involvement in that committee, and an emerging pattern of broader concern surrounding the superintendent’s work and undemocratic governance of our schools. In Kamras’s first 100 days, we saw early indicators the community was less sold on the new hire than Farrell implies. Before Kamras was sworn in, parent leaders were already putting forward concerns about his track record in D.C. in the local press. Richmond Teachers for Social Justice greeted the new superintendent at his first school board meeting by declaring any move toward the notorious merit pay system he crafted would be met with resistance. Public education advocates expressed concern surrounding the inflated salaries of his cabinet, all individuals hired without a public search and only narrowly approved by a divided school board. Teachers responded hopefully to Kamras’ support of the RPS walk-in, a sign he’s willing to respond to grassroots pressure, but his support came later than expected: A day after the Richmond Times-Dispatch article revealing the “culture of fear” surrounding Kamras’ teacher evaluation system in D.C.
Farrell, who has led Dominion Energy for 10 years, has a vested interest in promoting the narrative that Kamras is a community hire. Farrell’s broader work in the power industry draws its profit model from seizing unilateral control of democratic institutions under the auspices of “public process” and “public good.” Dominion power has been widely criticized as exercising disproportionate control over the Virginia General Assembly. Despite extraordinary public opposition, Dominion has proven itself uniquely empowered to take Virginian land, to custom-draft its own legislation, and to do so at tremendous cost to members of the public, who have no choice but to remain a captive and disempowered consumer base. The broader public in Virginia has thoroughly articulated their reluctance to trust our energy monopoly to govern in lieu of democratic process. Our last election season communicated this message clearly when 13 candidates who ran on platforms that specifically refused Dominion funding won seats in our General Assembly. As the public pushes back, however, Farrell and his corporate colleagues continue to demand disproportionate power over public institutions. Farrell is right to be concerned. 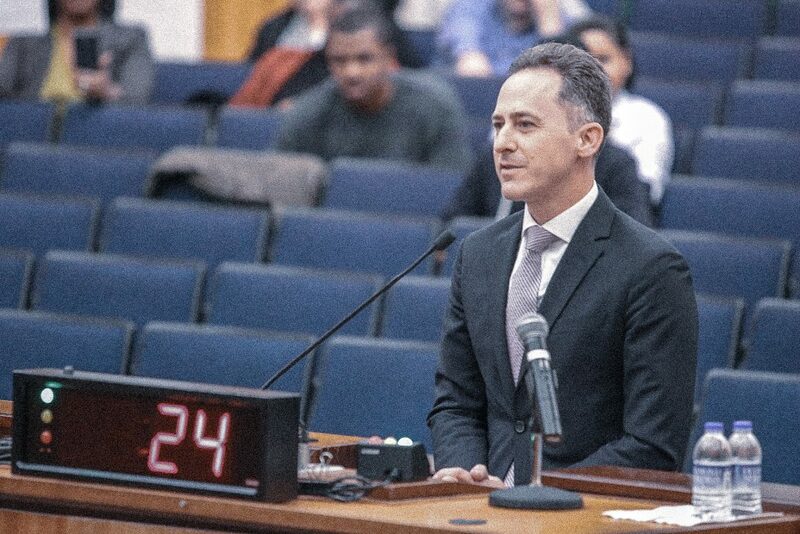 He not only chaired the committee that brought Kamras to Richmond, he also plays a leadership role in a particular strain of Virginia’s business elite that holds growing investment in bringing corporate education reform to our city. At stake is his long-standing interest in the Richmond public education system, which he has struggled to fully realize. In 2007, Farrell joined a movement of corporate leaders in the city of Richmond who advocated against an elected school board and in favor of a corporate monopoly on school governance. The Gang of 26, as they have become known, issued a now-infamous letter that demanded our democratically elected school board be “abolished.” Widespread public outcry, led by African-American education activists and the Richmond Crusade for Voters, pushed back at the prospect of a plutocratic school governance structure. Defeated, members of the Gang of 26 have continued to look for other avenues to disrupt democratic governance of public schools. Kamras comes from a school district modeled after the corporate reforms Farrell and his colleagues pushed in their 2007 letter. The precise legacy of corporate reforms in D.C. has yet to be fully assessed, but it is already clear that this system is much less successful than Farrell would have us believe. D.C. Public schools are facing external investigation for the widespread dysfunction that followed the area of structural changes aimed at privatization led by Kamras under former Chancellor Michelle Rhee. Concerns about the current state of D.C. schools include not only misrepresentation of student success rates to meet assessment goals, but also misallocation of funds designated for the students with the most need. As the ongoing failure of many of the corporate reforms pushed onto DCPS continues to come to light, Kamras has stocked RPS’ administrative cabinet with similarly-minded individuals, largely drawn from his D.C. cohort. Despite its many clear failures, the privatized education model endorsed by D.C. reformers has tremendous popularity with corporate elites. Kamras’ school management model promises to “do more with less.” It is a marketing campaign designed to shift attention away from our generational disinvestment from public schools and suggest that public institutions simply lack “innovative” leadership. This line of reasoning conceals the many ways US businesses have worked to divest from the working class in favor of the corporate class. It also acts as a signal to local wealth holders: If schools do more with less, they won’t be called upon to pay progressive tax rates. “Innovation” in corporate education reform doesn’t just starve the public sector, it converts public resources into private profit and weakens the labor movement. Corporate reform invites businesses to profit from schools through some of the industry’s dubious cash cows; consulting partnerships, technology procurement, and assessment expenditures. Privatized education reform has mercilessly attacked teachers unions, dealing a blow to local labor practices that directly benefits business owners who compete for low-cost employment conditions. These damaging reforms rely on the kind of underinvestment in schools that we see in cities like Richmond. While our schools struggle to make basic repairs and eliminate essential staff positions, private interests offer up donated resources in exchange for disproportionate power in designing school policy and influencing school governance. Members of the Gang of 26 have not made it onto our superintendent hiring committee by chance: They have bought their way to power through in tandem donations to schools (often through privately-funded non-profits) and politicians (who rely on large donors to back their current and future campaigns). Farrell. and members of Richmond’s broader corporate class, are not acting altruistically when they race to spend money on schools; rather, they are moving in on a sector that has tremendous potential to set local economic conditions–both for the working class and corporate giants like Dominion. As Kamras exits his first 100 days and as we start to see what his administrative approach will bear, it’s worth noting an underreported similarity with his governance in D.C.: A strong reliance on private funding that is not subject to public oversight. We know Kamras’ work within RPS has garnered money from Richmond’s largest corporate powerhouses, including Altria, Dominion Energy, and the Ukrop dynasty. He has also raised funds from the Robins Foundation, which has recently invested in a private education lobbying firm with direct ties to Michelle Rhee’s corporate reform engine 50CAN, a rebrand of her organization StudentsFirst. Private fundraising has become the subject of increasing concern as journalists and advocates assess what went wrong in D.C. Private investment put pressure on schools to uncritically implement the policies put forth by the Rhee administration, and private funding served to empower that same administration beyond the will of parents, teachers, and students. Today, Kamras is posed to repeat the same pattern. In a moment where our city government is unwilling to meet the needs of our school board’s budget, private funders are scrambling to buy into our schools through processes that are not subject to public oversight. A progressive taxation model would free our schools from corporate dependence, allowing for truly democratic governance. Without a progressive taxation model, the politically manufactured starvation of public education allows private interests to converge on our schools where they stand to gain disproportionate power over policy and practice. Much like in D.C. Public Schools, where the D.C. Public Education Fund raised money outside public process or public oversight, in Richmond the Richmond Education Foundation is perfectly situated to leverage the corporate connections on its board to raise money and gain power over the governance of our schools. If Farrell and other Richmond business leaders truly believe in supporting our public schools, they should not undermine democracy by attempting to direct school policy or school spending. The ongoing fight for school funding is directly tied to the fight for democratic governance of education spending. The failure of city leadership to fund our schools has created a demand for private funds, but we do not have to treat those funds as discretionary. Any funds raised and directed toward our schools must be publicly declared and spent according to the directives of the democratically elected school board that Richmonders in 2007 fought so hard to preserve. Such a policy would keep Richmond in line with the surrounding counties of Chesterfield, Henrico, and Hanover, where policies require grant- and externally-funded initiatives undergo school board approval before funds can be committed. Our superintendent is a public employee; he does not have the unilateral right to decide how money is used in our public schools. Private funds must be publicly disclosed, and the public should retain the right to decide how they will be allocated. If superintendent Kamras continues to raise private money in his role as a public servant, then the expenditure of that money must be subject to public oversight and democratic governance. Parents, teachers, and students know best what the priorities should be for our public schools. Only through democratic process can we preserve their voices and their power. These are our schools.